One of the High Holy Days traditions at Temple Shalom is our annual Food Drive. Just as last year, our beneficiaries will be the North Texas Food Bank (NTFB), and Jewish Family Service (JFS) Food Pantry, serving our community here in North Dallas and the Vickery Meadow area. Supporting these agencies represents our commitment to serving the hungry among us, both throughout North Texas and right here in our neighborhood. We have two ways for our congregants to participate – a virtual drive, and a canned food drive. Please consider a financial donation equal to the amount of money you would spend on food to feed your family for a typical day. Our goal is to raise $3,000 in this year’s High Holy Days Food Drive to provide 12,000 meals to hungry families in our area. 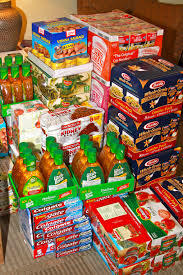 Click here to donate to our virtual food drive. Our virtual drive ends October 12. Please contribute canned food for the JFS Food Pantry. Click here for a list of needed items. In keeping with Temple Shalom’s recycling initiative, please use your own bag(s)/box(es) to bring in your canned donations for JFS. Donations must be received by October 12. No items will be accepted after that day. Click here to learn how the North Texas Food Bank helps feed the community. Click here for information on Temple Shalom’s food drive. Every $1 = 3 meals. 94 cents of every dollar donated goes directly to programs fighting hunger, with only 6 cents going towards administrative/fundraising expenses. In the state of Texas, 4.7 million people are food insecure – that’s 1 in every 6 people. One in every 4 children in North Texas is food insecure (more than 300,000 children). Only 9% of the individuals that we serve are homeless. It is not just the unemployed which we all hear about, but the under-employed; 95% of households served by the NTFB have an annual household income of $30,000 or less. The North Texas Food Bank provides access to nearly 170,000 nutritious meals a day. Although that number is great, there is a need for nearly 300,000 nutritious meals a day to feed hungry people in North Texas. Last year, the NTFB provided access to some 63.4 million meals to our 13-county North Texas service area. But, the Food Bank’s growth has been in stride with the country’s heightened rate of food insecurity. The United States is now facing a food insecurity rate of 48.8 million people. Questions? Contact Tikkun Olam Chair Debra Levy-Fritts at tikkunolam@templeshalomdallas.org.